Cote Saint-Luc Mayor Mitchell Brownstein has done a magnificent job in rallying all those around him since becoming mayor nine months ago. Mitch has brilliantly achieved consensus among members of council, has strengthened the city administration and brought our unions onside. He is building upon a magnificent legacy created over a decade by former Mayor Anthony Housefather. As an outgoing, effervescent and engaging full-time mayor. He created this wonderful recap of Cote Saint-Luc activities and accomplishments in 2016. There was a little bit of excitement at City Hall last night. Volunteer Citizens on Patrol team leaders Abe and Elaine were in the back parking lot training other members on scooter. Elaine smelled trouble, literally, but couldn’t quite place what it was. As she looked towards the park area behind the library, she saw smoke – quite a bit of smoke. 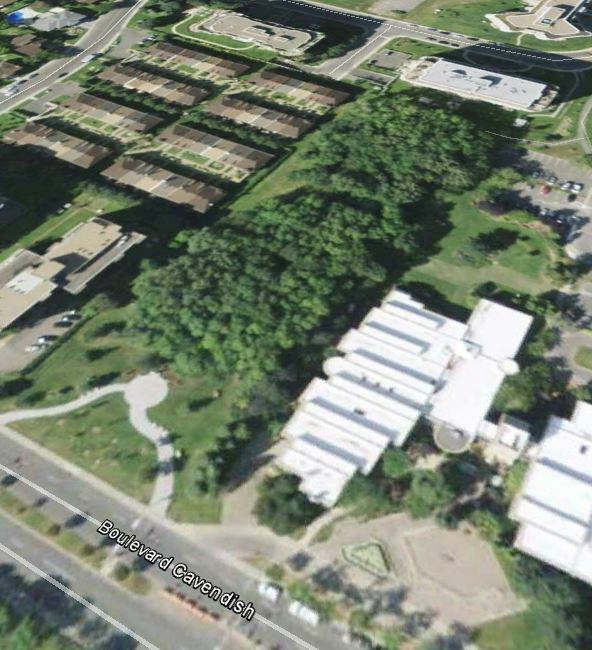 Aerial view of Cote Saint-Luc City Hall area. Google Earth 2013. She ran over and found the cause of the smoke: someone started a bonfire of school books! Whoever did this hid it among the trees and bushes so it wasn’t that easy to find. Elaine stomped it out then ran to get a bucket of water from the vCOP office to drown out any embers. The first dumping of water put the fire out but she wanted to be absolutely sure, so she returned to the office and refilled the bucket. She soaked the area thoroughly. Meanwhile library staff called the fire department. Police also responded. Elaine was able to salvage one book and quite a few papers with a person’s name on it. Seems like the youngster was in elementary school. The book was turned over to library staff who passed it on to police. When the Fire Department arrived they found that Elaine had single-handedly extinguished the fire to their satisfaction. The police were able to call the parents. One can imagine that this child will have a stern warning or punishment for a graduation gift from the angry parents. Another exciting night for vCOP – the eyes and ears of our emergency services. A special thanks to Elaine for her quick actions in putting out the fire and in preserving the evidence for the police. Our mayor can marry you. Literally. If you’ve just set a date for your wedding and want to get married in Québec, this can be an exciting time for the two of you! But, it gets even better. Cote Saint-Luc Mayor Anthony Housefather and City Councillors will be authorized by the Minister of Justice to “solemnize marriages” within the territory of Cote Saint-Luc. In Québec, the following can perform your wedding ceremony: a judge, a justice of the peace, a minister, a clergy member who is registered under the Marriage Act, mayors, municipal officers so designated, members of municipal or borough councils, and designated clerks and deputy clerks. So if a wedding at the Montreal courthouse doesn’t quite do it for you how about Cote Saint-Luc City Hall or at the Aquatic and Community Centre with your very own Mayor (or City Councillor) presiding? And the area immediately around City Hall makes for gorgeous wedding photo shoot!